Canada is the second-largest country in the world, after Russia. Canada has the largest coastline in the world, with a length of 122,557 miles (202,080 kilometers). If you walked the shorelines of Canada with an average speed of 12 miles (20 kilometers) a day, it would take you 33 years to complete. The U.S.-Canadian border, officially known as the International Boundary, is the longest international border in the world between two countries. Canada is said to be a Latinized form of a word for “village” in an Iroquoian language of the St. Lawrence valley that went extinct by 1600. Most still-spoken Iroquoian languages have a similar word (such as Mohawk kana:ta, or “town”). To Sabbath School teachers: This story is for Sabbath, May 5. Click here for photos to share while telling the mission story. 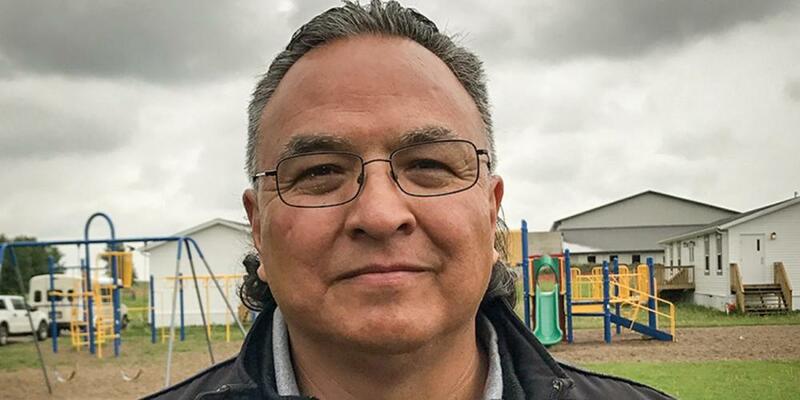 The new chaplain, Daniel Guiboshe, felt like an outsider when he arrived a month late for the school year at Mamawi Atosketan [pronounced: MAMA-way a-TOSS-key-tan] Native School in Alberta, Canada. The chaplain and little girl engaged in small talk about homework and friends on the playground. In the classroom, Daniel taught Jojo and her classmates about Jesus and the plan of redemption. The Adventist mission school is the first place that many First Nations students hear about Jesus. One day, Jojo surprised Daniel with a drawing of a purple bug. “Your the coolest pastor ever!” she wrote beside the hand-drawn picture. “Your every nice to me,” she added, making a few grammatical mistakes. Several weeks later, Daniel received a phone call from the school principal. Jojo had died over the weekend. She had been goofing around with helium at a birthday party, making funny voices. Complaining of lightheadedness, she had gone to bed and never woken up. The teachers and students grieved the loss, and school was closed for a day. Jojo’s family organized a traditional three-day wake in a recreation hall on the First Nations reserve. People came from all over to eat, give speeches, comfort one another, and pay their respects at Jojo’s casket. Teachers and students attended the wake, and the teachers prepared food in the school kitchen and brought it to the recreation hall every day. He said teachers and students came together as a family, reflecting the school’s name, Mamawi Atosketan, which means, “Working Together,” in the Cree language. Today, Jojo’s hand-drawn picture hangs in Daniel’s office. It’s the first picture that he ever received from a student at the school. When Daniel speaks to the children, he talks about what Jesus did for them and what they can do for others. He tells them his own experiences with Jesus. His main goal is to uplift Jesus and let the Holy Spirit do the rest. Part of this quarter’s Thirteenth Sabbath Offering will help the Mamawi Atosketan Native School expand its education program so it can teach more children about Jesus. Thank you for your mission offering.